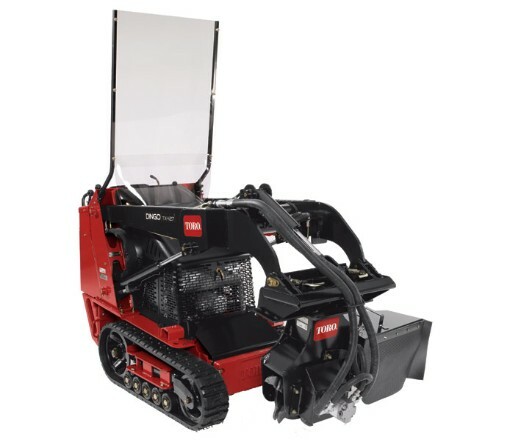 Looking to rent a Stump Grinder attachment for the Toro Dingo in Rochester NY, Ithaca NY and Western New York? The Stump Grinder Attachment is a widely respected Tool Rental item. Extremely capable in grinding stumps up to 16.5 inches below grade and 36 inches above grade. Important safety protection: brake automatically is engineered to stop within a few seconds, once the operator relinquishes control of the handle. Widely respected as a tremendous productivity tool rental item by professional landscapers. Number of Teeth = 20. Wheel Diameter = 17 inches until the machine tips over. Wheel Stopping Time = 5 seconds. Width = 26 inches with the chip guard.